Let’s talk about one of those elephant in the room things: not all clients are equal for a professional service firm. As human beings they might all be equal, but as clients they are not. Knowing which ones to invest more effort or resources into and which ones to put on life support only can be the difference between success or failure for a firm. That’s why segmenting a client base makes good sense in professional services. It is the most robust way of working out who can make you, and who can break you, when allocating your time and resources. Segmentation is about working out where the real money is coming from in your business so you can do more of it, and with it. Regardless of what you call a particular segment, or client service category, the underlying principle of categorising correctly – in a commercial sense – are the same. For the purpose of the exercise here we will use the most common method of categorisation: A, B, C, & D. I do urge professionals to think carefully about the labels they put on categories. Clients CAN access files and records, and relationship perception matters enormously. If a client sees on a record that they are categorised as a “D” client they will form a view about your professional relationship…and it probably won’t be favourable. Why not call all clients “A” clients? But some are actually just an “A”, some are “AA”, “AAA” or even “AAAA” – doesn’t that send a whole different message to any individual client regardless of what category they are in? Putting that aside however; the essential principle that lies at the heart of client segmentation is that a client base should be segmented on the basis of the value of the client to the firm and therefore be a guide to what the firm should invest in that client on an ongoing basis. The actual value of individual clients will vary amongst different professionals depending upon the business structure and business lines offered by different practices, together with the values and future strategies of the firm. Regardless of the valuation methodology the typical professional finds themselves in the fullness of time dealing with about 300 or more accounts (generally speaking). A clients will number around 20 or so, and generate about 25-30% of the value. 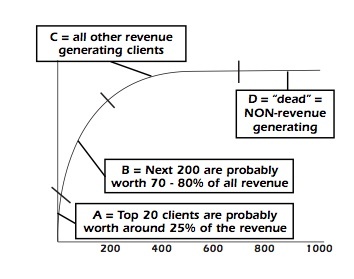 B clients will number around 200 or so, and generate about 60-70% of the value. So that Pareto Principle kicks in….and you will begin to realise that about 80% of the hard work is coming from 20% of the clients. You KNOW what decision you need to make there don’t you? Related: Good? Fast? or Cheap? What Sort of Advice Is It Going to Be? More importantly, you can begin to work out where exceptional attention and servicing effort will pay off for the firm. BUT…to improve the value of a client base over time you need to continue to measure and monitor segments and values. One of the key ingredients in the professional service offering is TIME, and you need to monitor where that is best spent. It is not as simple as saying more time should be spent on those who are the most valuable today. Think about measuring and monitoring the AVERAGE VALUE of the clients in each group regularly (e.g. 2 x p.a. ), as that will tell you where the best returns are coming from. C Clients are worth $50. 10% growth in the value of the A Clients versus 28% growth in the value of the B clients…that might suggest the return on time or resources invested in B clients has been worthwhile, and it might just be a sign of some fundamental shifts in how the business (and you) are being valued. It could be a sign to the future…. Not all clients are equal value. And not all clients stay in the same segment over time either, because the market shifts, and value shifts. Some clients can make you, and some can break you. But it just may be that ones who can make you don’t look like it yet.